Wherever this goes from here—continued player protests during the national anthem; actual reform-oriented initiatives sponsored by the NFL; more diaper-filling from the president of the United States—one obvious takeaway from this week’s league meetings here in Manhattan is that the players showed how much power they wield when they take a collective stand. In a span of 10 days, the storyline went from Jerry Jones threatening to discipline any player who would demonstrate during the anthem to a whole lot of dissembling from the league office to a face-to-face meeting involving players, owners, and the commissioner in which the players conceded absolutely nothing. The NFL is a ruthless, bottom-line business, and despite multiple indications that business has indeed taken a hit, the owners didn’t so much as take a vote on whether to change the anthem policy to compel players to stand. Not only that, but the owners also committed themselves to partnering with the players to do something tangible about the social-justice issues at the root of the protest. Whatever form that involvement takes remains to be seen—and given the league’s history with co-opting causes, it will likely result in a self-serving whitewash of some sort—but right now, that’s not the point. Because the Washington Generals won. Both outside league headquarters on Park Avenue and downtown at the fancypants The Conrad, there was a lot of boilerplate talk from both labor and management about positivity and unity and dialogue. Make no mistake, though: If the owners thought it was worth forcing the players to stand, they could have made that happen. Instead, there was Giants owner John Mara, an avatar of the league’s traditionalist establishment, talking about the importance of the First Amendment even in the context of the workplace. The union famously took a beating at the bargaining table with this CBA, and it’s currently trying to chip away at the league’s dominance by defending, on process terms, a man credibly accused of beating a woman. 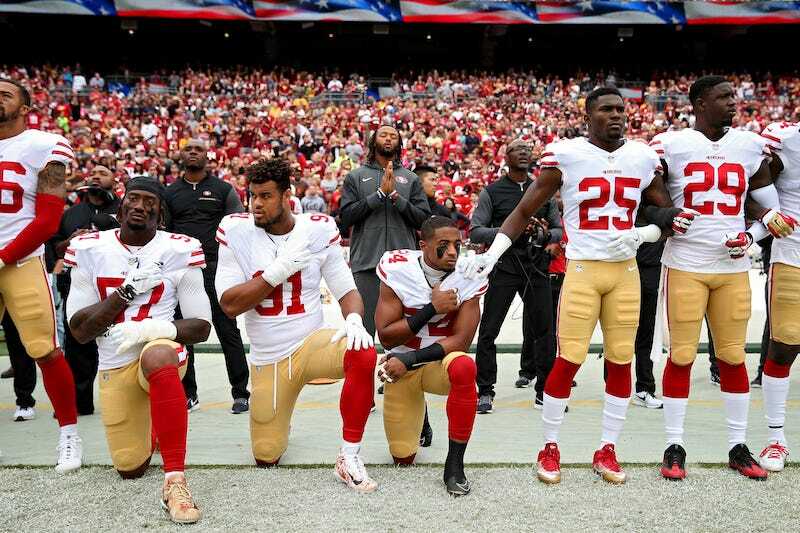 The right of black athletes to “protest the flag” may not represent the most obvious ground on which to wage a fight against the league’s power structure, but there’s no longer any denying it has been an effective one. The players’ arguments have resonated—if not with all fans, and if not in the White House, in places and with people who count. What’s really notable here is that the owners backed off even though they believe the protests are costing them money. Mara conceded that business has been affected. He echoed something he had said several months ago by saying that “the overwhelming majority” of fans he hears from “believe that we should be ordering the players to stand.” The MMQB’s Albert Breer even reported that the owners were presented with data that showed television ratings are in sharp decline (albeit with the caveat that the public’s viewing habits are changing). And yet the league still chose to do nothing. You don’t have to be too cynical to not quite buy this. It seems much more likely that owners, faced with the reality that players would not back down—that they would, even if forced to stand for the anthem, keep speaking out about that and about the underlying issues here, while staying unified—decided not to force the issue as part of a broader cost-benefit analysis. In all of this, there is an acceptance that players aren’t simply going to stop because it’s what management wants. The owners have for once recognized them as partners, rather than as disposable parts. There was no dealmaking whatsoever. “It’s not a quid pro quo,” Mara said. This after 49ers safety Eric Reid appeared at the players-owners summit on Tuesday wearing a visible #IStandWithKap T-shirt beneath his suit coat, and after Reid subsequently told The MMQB’s Jenny Vrentas he plans to continue to take a knee. What to make of the league’s commitment to addressing the issues that animated the protests? Former player Willie Colon caused a bit of a stir by saying he was told the owners didn’t seem all that willing to listen to the players, but a source with knowledge of Tuesday’s meeting said Colon’s report didn’t quite mesh with their understanding of how the meeting went down. Not that it matters. When Goodell was asked point-blank about his grasp of the players’ concerns, he noticeably avoided using the words “race,” “racism,” and “police brutality.” The 49ers’ Jed York, a rare progressive owner who seems to be finding his voice by championing the players’ cause, insisted that if the NFL’s approach “isn’t sincere, you’re going to see through it.” That’s already true of the way the league has subsumed causes like breast cancer awareness and tributes to the armed forces, though. Does anyone really expect this one to play out any differently? Either way it’s a discussion for another day, and the fact is that this—rather than a legal battle over the role of the First Amendment in the workplace in which the owners pander to Trumpism by showing black athletes who’s in charge—is testament to the power of collective action. And there is no reason to be entirely cynical here. The purpose of the protests was to seize the attention of those who might otherwise have paid it none and to use moral suasion to change minds, and it seems to have worked on no less than John Mara. Something for the players to keep in mind.